NCR Corporation (NYSE: NCR), a leader in banking and commerce solutions, today announced that its Global Headquarters in Midtown Atlanta has been awarded two Leadership in Energy and Environmental Design (LEED) Platinum certifications, for Building Design and Construction: Core & Shell and Interior Design and Construction: Commercial Interiors. In partnership with Cousins Properties and other project partners, NCR’s innovative Global Headquarters is one of the first projects to be awarded two of the highest LEED certification levels for the same building. NCR achieved LEED Platinum certifications for implementing practical and measurable strategies and solutions aimed at achieving high performance in: sustainable site development, water savings, energy efficiency, materials selection and indoor environmental quality. During the interior buildout, more than 87 percent of construction waste was recycled. The building is expected to use 35 percent less water and 30 percent less energy than a typical office. The building achieved LEED Platinum for both the renovation of the exterior Core and Shell, as well as the Commercial Interior. The LEED rating system, developed by the U.S. Green Building Council (USGBC), is the foremost program for the design, construction and operation of green buildings. More than 95,800 commercial and institutional projects are currently participating in LEED, comprising more than 20 billion square feet of construction space in all 50 states and 167 countries and territories. “Two LEED Platinum certifications for one project is a unique accomplishment, with less than ten projects touting that honor at this moment. The work of innovative building projects such as NCR’s Global Headquarters is a sign of innovative and dedicated leadership and a fundamental driving force in transforming the way buildings are built, design and operated,” said Mahesh Ramanujam, USGBC President and Chief Executive Officer. NCR Corporation is proud to have collaborated with Cousins Properties and other key partners including JLL, Duda|Paine and HKS for the base building architect team, Gensler for the interior architect, as well as Integral Group, AHA Engineers, WorkingBuildings, Kimley-Horn, Uzun + Case, HGOR, Holder Construction, and HITT Contracting and many more. 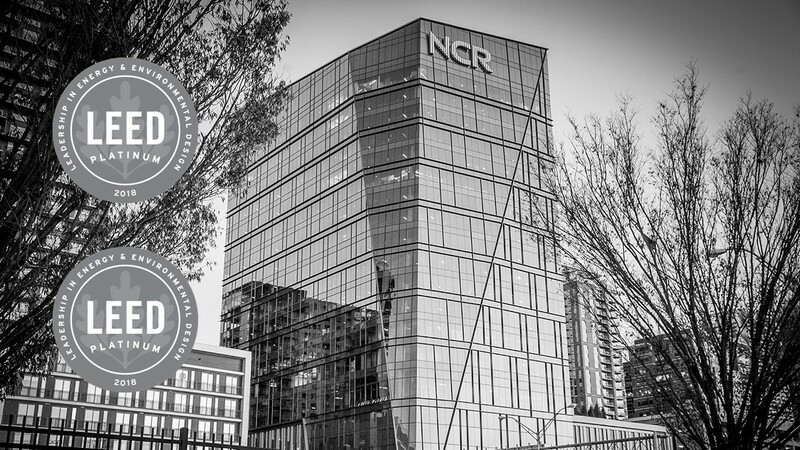 On Wednesday, Dec. 12, at 10 a.m., USGBC will present NCR and Cousins Properties with its dual LEED Platinum award at NCR’s North Tower Lobby in Atlanta. Mike Hayford, NCR President and CEO, along with representatives from USGBC and Cousins Properties will attend.